The problem with guide books is they are written by and for Capitalists. Pages and pages of shopping, eating, sleeping, consuming, consuming, consuming. The first entry in any guide book is about money. Where to get it, how to change it, what to do if you need more. The rest of the book is devoted to how to spend it. But not everyone in the world is so shallow. A group of us got together and founded the Worker’s Guide to the World series. Travel books written along Marxist lines, for the traveller who cares more about struggle and revolution than souvenirs and exchange rates. We were in Beijing, researching. Cuba had come out the April before. Vietnam in June. The People’s Republic of China was divided into six areas. Luis and I got Beijing and Manchuria, the North-East of the country. Relieved not to have drawn the Long March, we identified our main areas of initial research. In Beijing we would focus on the Party, the symbols of its glory past and present in the capital city and, of course, the final resting place of Comrade Chairman Mao. In Manchuria we would look into the victorious struggle against the Imperialist Japanese invaders. Luis got in touch with a guy he knew from university, Jun-wei, who promised to show us around. I’d never met Jun-wei, but I assumed he’d be useful. Luis had explained the situation, what we were after, and Jun-wei said he understood. There’d been a breakdown in communication somewhere. 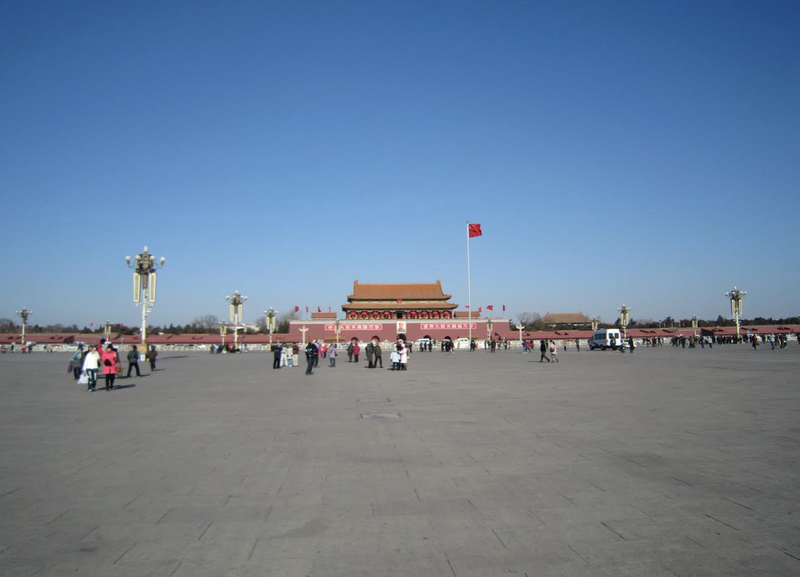 We’d got off the subway at Fuxingmen Station with the intention of walking down Xichang’an Jie taking in all the major sights: the Presidential compound, the Great Hall of the People, and, of course, the Square of the Gate of Heavenly Peace – Tian’anmen Square. Just walking in the winter air I could sense the difference. We weren’t in a Capitalist cess-pool now. This was a place where Marxism was at work, building. It was exciting. Crisp and clear. Pure. So far Jun-wei had shown us only hotels. I wouldn’t have minded if any of them were particularly relevant: a hotel that hosted some great meeting, say, or one taken over in the revolution and its doors opened to the people. Even a hotel whose bourgeois owners had been taken out and shot on such a day and at such a place for crimes against the people. But no, he seemed to be showing us luxury. He’d even tried to show us the Xidan Beidajie shopping street, replete with Pizza Huts, KFC and Zara. We walked on some more, the freezing wind in our bones slowing our progress. I’m from a cold country, so I could take it, but Luis’ South American blood was freezing. “Some narrow streets and high buildings might keep us out of the wind,” said Luis. We’d reached an enormous glass and steel building, like a UFO. “Is there anything good on,” said Luis, joking. Heat. It wasn’t unwelcome but we were standing in a theatre lobby, one of the churches of bourgeois decadence. I didn’t want to be there, surrounded by all that corruption, the insidious influence of the West creeping even into the People’s Republic. Jun-wei wanted us to see the arena. We said no. So did the staff. “What’s his problem?” I asked Luis. “How far to the Comrade Chairman?” I asked him. Back out and as we waited at the lights to cross, important black government Audi’s whipped through the red lights on their way somewhere, doing the work of the people. On the corner an old man in blue work clothes stood staring back at the Egg, urine pooling around his feet. Everyone’s a critic. I gave him some money. We passed the Presidential compound, high walls, cameras and heavy security presence. Maoist slogans large white on red. Everything was red. The colour of China and the colour of Communism. A perfect match. I asked Jun-wei what the signs meant. “That one says ‘Long live the great Communist Party of China’ and that one says ‘Long live the invincible Mao Zedong Thought’.” He moved off towards the traffic lights. I couldn’t quite get my head around Jun-wei. He seemed to be – and it seems bizarre to be saying it, but it is the most appropriate word – embarrassed by his government. I mean, I know the state isn’t perfect, but the point is it’s trying to reach that perfection. Capitalist states think they are perfect and so have stopped trying. The socialist state is only a stage on the way to a stateless communist paradise. Jun-wei’s country is at the vanguard of this, yet all he wants to show us is hotel after shop after theatre. Finally we reached Tian’anmen Square. I had to admit to feeling a little awestruck. It truly is a space which honours the grandeur of the Chinese people and the Communist Party of China. Vast. Imposing. Framed by the Forbidden Palace and its grandstand for dignitaries to the north, the Great Hall of the People, home of the National People’s Congress to the west, a museum to the east and south of us, in the centre of the square, is Chairman Mao Memorial Hall, his final resting place. Luis had his camera out, slowly stepping in a circle, presumably to get a panoramic shot. I looked at Jun-wei. He looked at his watch. “You must be very proud of this,” I said. The flags, the architecture, the obvious power of his country, the success of the Party. Jun-wei looked at his watch again. We ran to the hall. Sure enough a big sign showed they close at noon. It was 11.53. “We need our passports,” said Luis, waving his at me. I unzipped my bag and pulled it out when a strong hand caught my chest and stopped me dead. “No bags,” said the soldier. “I have my passport,” I said. “No bags,” he said again. “You cannot take a bag inside,” said Jun-wei. Time moved closer to twelve. “No cameras too,” he said to Luis. “Take this,” said Luis, handing me his camera. “If you can’t go in you can look after it for me.” And they both ran off to see Comrade Chairman Mao, leaving me behind in the square. Fuming, I stomped around. People were watching me and I realised I was holding Luis’ camera in my hand. I put it in my pocket lest anyone try to grab it. At least if I got mugged, I thought, I can give them his camera and keep my own. Minutes went by. It really was exposed. The wind stormed across the expanse with nothing to break its progress and crashed into my body. I took out Luis’ camera and checked his photos. I was looking at them when they came back. “These aren’t very good. You haven’t captured the magnificence of the space,” I told him. Creepy? He had the honour of seeing the Comrade Chairman and all he could say is it was creepy. “The government want to move him,” Jun-wei said, voice low. Thinking about the guide, we hadn’t accomplished much. Very little to write up, and I hadn’t even seen the Comrade Chairman. Beijing was seen as the best posting. We have to produce something spectacular. I needed to see Mao. We needed decent photographs. It wasn’t going well. Jun-wei led us through twisting back streets lined with stalls selling a variety of food, including deep fried insects on sticks. There were also some souvenir stalls and at one I bought a pin badge. It had some characters I couldn’t read, a building, the hammer and sickle. “It from Long March” the trader said. “When Mao become leader of Party.” I pinned it to my scarf. The smells were vivid, and my stomach signalled it was ready for food. We followed Jun-wei into a dead end of five shabby looking restaurants. Staff from each restaurant surrounded us shouting, presumably about their food and prices. Jun-wei ignored them. I looked at Luis who was trying not to laugh. What was wrong with this guy? The noodles were good, warm and filling. We came back out with satisfied stomachs and defrosted cores, ready for some more research. Now Luis wasn’t even trying to hide his laughter. I felt better but I still didn’t feel like laughing. We were wasting time doing Lonely Planet nonsense when we should be working. We crossed another busy shopping street and went into a chain restaurant. Jun-wei ordered. Luis was laughing again. Jun-wei seemed to have noticed for the first time. “And soup,” I added. I didn’t think this was as funny as Luis did, but it was certainly ridiculous. I couldn’t help smiling. After lunch part two we resumed the tour, this time at a slower pace. Noodles and duck is a bulky load to carry around. He took us into a small courtyard. The building surrounding it was beautiful. Jade green and blood red, curved wood eaves and stone steps. Three black Audis were parked inside. Another two stood ready out on the street. A huge man in a suit came over to us and talked heatedly with Jun-wei. Without understanding a word of Chinese I knew we weren’t welcome. Sure enough, we were escorted back onto the street. “What kind of office is it?” I asked. He looked at me. Back at the Audis. Before I could answer him Luis stopped me with a hand, a shake of his head. We settled into a sofa by the bar and ordered a round of Tsing Tao. The music was loud here, Chinese heavy metal. I’d never have guessed that Jun-wei was a headbanger, but he seemed different here. More relaxed. More comfortable. He and Luis chatted about bands for a while, swapping tips and album names. Once the second round of beers arrived Jun-wei asked us about the guide book. I did. “This is a strange idea for me,” he said. “Many bad things happened because of this ideology. Many people died. But it is the ideology that made China strong again. Socialism and Communism are maybe different for us than for you in the West. It should be a tool. A means to an end. But our leaders have made it the end. They are happy with the country now because they are at the top. They have stopped working. We are not happy yet. But we are working hard. He took a drink, checked again that we couldn’t be heard. Iain Maloney is from Aberdeen, Scotland but now lives in Japan. His fiction, poetry and journalism has been published around the world. His novel First Time Solo, a tale of Second World War pilots and jazz, is out now on Freight Books.